BUENOS AIRES (JTA) — A Jewish human rights group asked the president of Argentina to help prevent a planned visit to Colombia by an Iranian implicated in terrorism. Shimon Samuels, the Simon Wiesenthal Center’s director of international relations, conveyed the request Thursday in a meeting with President Mauricio Macri at the government palace here. Mohsen Rabbani, a former Iranian cultural attaché in Argentina, is scheduled to visit Bogota as a representative of the Iranian government in a delegation seeking to increase trade. Rabbani has been wanted by Interpol since 2007 in connection with the 1994 bombing of the AMIA Jewish community center in Buenos Aires. He was implicated in that attack by the Argentinean government, whose judiciary determined Iran had a role in planning and carrying it out. Eighty-five people died in the blast. Samuels said Macri is “fully committed to hold accountable for this terrorist outrage six Iranian officials named by Interpol,” including Rabbani. The London-based newspaper Asharq Al-Awsat reported Monday Rabbani’s planned participation in the Colombia visit by officials from the Iranian Islamic Revolutionary Guard Corps. In recent years, Iran expanded its activity in Latin America, including the 2014 opening of a news agency based in Buenos Aires devoted to covering the continent. Also in 2014, the Israeli government launched a three-year plan to strengthen its economic ties with five Latin American countries, including Colombia. Colombian President Juan Manuel Santos received in 2012 the Shalom Prize by the World Jewish Congress. Early this year, Colombia’s ambassador to Washington, D.C., held a reception in honor of WJC President Ronald Lauder, who called Colombia a friend of Israel. Colombia was one of only four Latin American countries that abstained from a 2012 United Nations General Assembly vote on a motion supporting the creation of a Palestinian state, which Israel opposed. Only one Latin American country, Panama, voted against the motion. 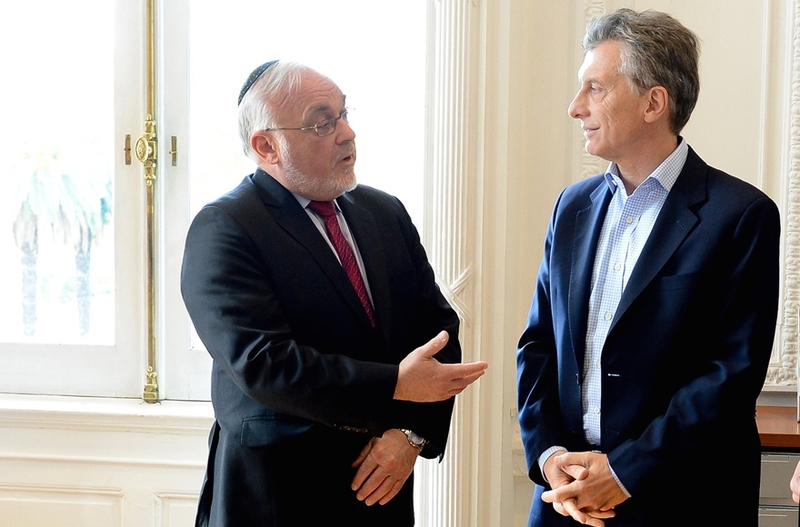 During their meeting, the Simon Wiesenthal Center delegation asked Macri to reverse Argentina’s vote in favor of a resolution passed by UNESO in April that Jewish groups and Israel said ignored the Jewish people’s ties to Jerusalem.